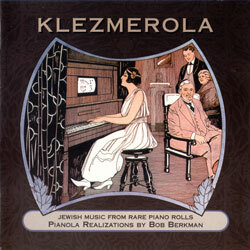 The first time I heard Bob Berkman’s CD, Klezmerola, I just couldn’t stop playing it. I loved the old time sound that Bob was able to achieve with his pianola. I loved the way the sound of the pianola (player piano) augmented the impact of the music that had once defined a generation of Jews and now was fading from memory. I am delighted that the Judaica Sound Archives at Florida Atlantic University can now boast a collection of 47 Jewish songs by America’s premier pianolist, Bob Berkman. I wrote the following review in September 2008 for the Association of Jewish Libraries. After listening to the CD many times since then, I still feel the same way. 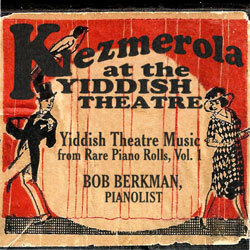 In the liner notes for his two volume CD, Klezmerola at the Yiddish Theater, Bob Berkman tells us that ” Piano roll manufacturers…were eager to record and sell current hits, and for attracting immigrant Jewish customers there was no greater source than Yiddish Theater…The market was never a large one…and surviving examples are rare.” The music on these three CDs took over 35 years to assemble. The piano rolls only contain notes (like sheet music). Bringing them to life with dynamics, accents, phrasing, and emotion is the work of the pianolist, the person operating the player piano. Bob Berkman’s unique talent revitalizes this vintage music, providing a generous portion of nostalgia. . . . with a twist! 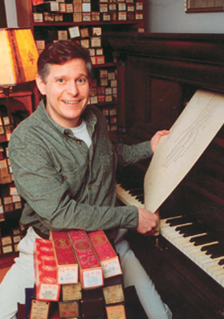 Bob Berkman’s love affair with the pianola began in 1975 when he was hired by QRS in Buffalo, NY, the world’s last remaining piano roll manufacturer. His talents brought him the opportunity to work on such films as Ragtime, The Best Little Whorehouse In Texas, and Reds ( in cooperation with Stephen Sondheim). He has appeared on NPR, BBC, and CBS Sunday Morning. Using a 1912 “push-u p” portable pianola, Berkman effectively turns any piano into a player piano allowing him to perform in venues all across America. In great demand as a speaker and performer, his unique and deeply personal work with Jewish rolls has been especially gratifying to him. His important discovery of George Gershwin’s only Jewish piano roll and the haunting A Gitte Nacht by the obscure Samuel Perlstein are among his most treasured accomplishments. For information about how to buy recordings by Bob Berkman, please click here.